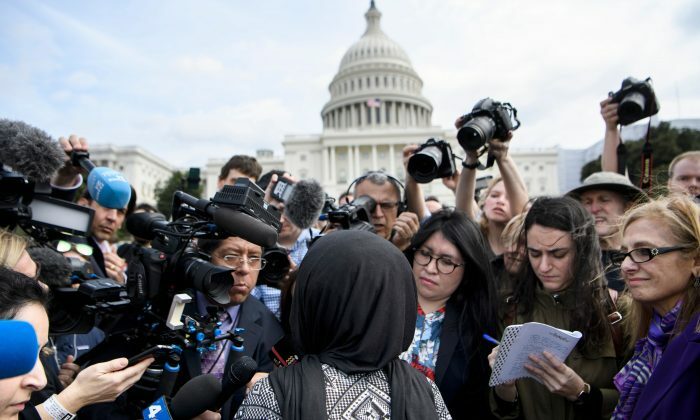 A number of prominent Democrats have condemned President Donald Trump for quoting Rep. Ilhan Omar’s (D-Minn.) dismissive description of the 9/11 terrorist attacks while at the same time, not disavowing the content of their colleague’s remarks. The president and members of the Republican party have accused Omar of minimizing the 9/11 attacks, while Democrats have condemned Trump for allegedly inciting racism and violence. Omar made the comments at a Council on American-Islamic Relations (CAIR) fundraiser. High-profile Democrats, including 2020 presidential contenders, were quick to come to Omar’s defense. Rep. Alexandria Ocasio-Cortez (D-N.Y.) suggested that Trump put Omar’s life in danger while saying that any silence from her colleagues “is to be complicit” in his “dangerous targeting” of Omar. Joe Kennedy III (D-Mass.) made similar attacks against the commander in chief. House Judiciary Committee Chairman Jerrold Nadler (D-N.Y.) said he had no issue with how Omar characterized 9/11. Sanders also questioned why Democrats refused to condemn Omar for the comments Trump was highlighting.